As reptile breeders, we spend a lot of time deciding what products to use in order to keep our breeding colony healthy. I’m sure we all want our females to produce healthy offspring, so we make sure they are well supplemented and at a healthy weight before breeding. This same concept carries over to how we go about deciding what medium to use for incubating the eggs. We all want to guarantee the best hatch rate for those eggs, right?! Also, once your females begin ovulating, it’s time to start thinking about what type of unit you are going to use in order to incubate those eggs. Naturally, most smaller breeders use a Hovabator incubator with plastic containers inside housing their eggs since it is the most economical and easily accessible option. 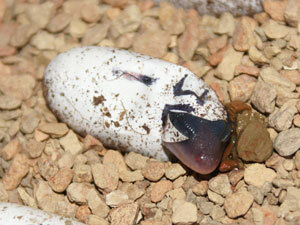 There are of course other options for larger breeders who incubate hundreds of eggs at a time. 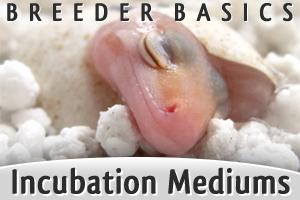 The results discussed in this article are based on my experiences using three different types of mediums for incubating Leopard Gecko and Fat Tail Gecko eggs using two Hovabators. The 1st Hovabator was set at 83 degrees, while the other was set at 88 degrees. For over 12 months, I have used different incubation mediums for my eggs and compared my successes with each of them. The three incubation mediums that will be discussed in this article are Vermiculite, HatchRite, and SuperHatch. This article does not discuss the incubation methods of eggs being suspended above an incubation medium, but buried within the medium. 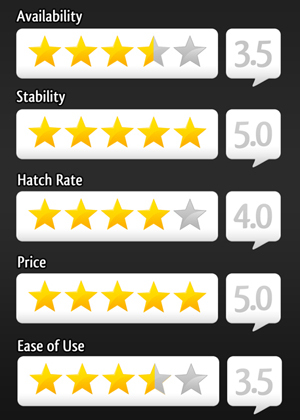 We will be giving ratings on a 5 point scale for each of the mediums in the following categories: Accessibility, Weight, Price, Ease of Use, Hatch Rate, and Overall Value. Each of the mediums will be given an Overall Score based on their ratings. Lets get started! Availability – Accessibility of the product. Stability – How the eggs react to disturbances to the medium. Hatch Rate – Ratio of egg successes vs. failures that a novice breeder may experience. Price – The cheaper the product, the better for your pocketbook. Ease of Use – Simplicity is always key. Availability – Vermiculite is relatively easy to find, and is usually available at your local home garden store. The tricky part is finding organic ‘asbestos free’ vermiculite. This may require some phone calls to hunt down, but in a pinch you should be able to find some that you can pick-up locally. Stability – When vermiculite begins to lose moisture in the incubation process, it becomes very light and airy. On several occasions I found a new hatching that had turned over the other eggs in the container. Also, if the container is bumped unexpectedly the eggs may be disturbed. Hatch Rate – The novice breeder may have difficulty finding the correct water to vermiculite ratio, as vermiculite is extremely absorbent. If prepared improperly the vermiculite may be too dry or too moist for optimal incubation and there may be a ‘learning curve’ to discover the proper moisture needed for the eggs. If it is too dry the eggs will also become dry and start to cave in. On the other hand if it is too moist the eggs can mold. Either of these conditions may cause a high number of egg failures as you learn what works best for you. Price – You can purchase a 20 gallon bag at Home Depot for $25-$35. If you require only 1-2 gallons at a time, you can usually visit your local garden store and find smaller bags for around $2.00-$5.00. Ease of Use – The most obvious downside to using vermiculite is finding the correct water/medium ratio. It is crucial to make sure the eggs don’t mold or become too dry. As stated above, incorrect moisture levels could possibly cause a drop in your hatch rate. Overall Value – Vermiculite is definitely a case of price over ease of use. If you are patient enough to work through establishing the proper moisture levels, then vermiculite could be the perfect choice for you and your eggs. Score: 78% or 19.5 out of 25. Availability – This product is a pre-moistened perilite mixture that is available online or at Reptile Shows. Many large reptile supply companies stock HatchRite, so you can add it to your regular supply orders to save on shipping. Stability – This product is very lightweight and airy, and therefore eggs in the container are very easily disturbed by new hatchings or unexpected ‘bumps’ to the container. 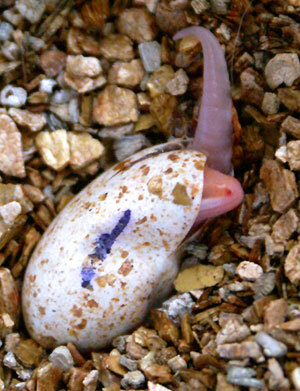 I had a particular experience with this medium where a new hatchling had completely dug up the container and had moved around all the other eggs, upside down and sideways. Hatch Rate – For the average keeper, this medium has an excellent hatch rate. It was designed to create optimal incubation conditions. You don’t need to set the moisture level, it’s already pre-moistened. My hatch rate experience with this product has been good, with very little drying or molding of eggs. Price – This product can be expensive for a large scale breeder, coming in at around $10-$13 per 2 pound bag, plus shipping. For smaller breeders, the higher price might be worth it for the ease of use. Ease of Use – This is the simplest product available on the market today. Open the bag, pour it into your container, add the eggs, and you’re done! Overall Value – HatchRite is a great product for those that are looking for a simple incubation solution. This is a case of ease of use over your pocketbook. 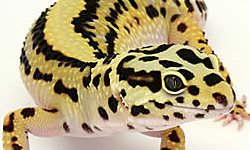 Availability – This medium is also a little more difficult to come by but can be found online and at reptile shows. Stability – SuperHatch is the most stable of all the incubation mediums because it is fairly heavy. New hatchlings very rarely disturb the other eggs in the container and small unexpected disturbances have no effect on the placement of the eggs. Hatch Rate – In the same way as vermiculite, this product requires the breeder to find the correct water to medium ratio. There are detailed instructions on the bag that can be followed, however if the product is over- or under- moist, a novice to this product may experience egg failures. However, in my experience with this product I have had less drying or molding than I have had with vermiculite. For a simple guide to using SuperHatch, you can view our guided video on YouTube. Price – This product is very affordable at approximately $4-5 plus shipping for a 2 pound bag. This is also the only incubation medium that is easily reusable and therefore a worthwhile investment. Ease of Use – This product provides instructions on the bag that can make the learning curve easier, but it also requires time to learn what works best for your incubation needs. Overall Value – SuperHatch is relatively inexpensive, reusable and provides instructions for use. 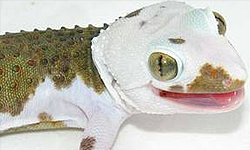 We rated this product the highest because we feel its overall value fits right in with with what the average gecko breeder is looking for. Each of these mediums have their pros and cons. The purpose of this article was to share my experience with these different products and hopefully help my fellow reptile enthusiasts decide what product may work best for them. Whether you are looking to save money or time, there is an incubation medium that is right for you! This is a great article!!! Alot of info that isn’t really anywhere else on the net. I’m glad someone finally did a decent study and put it out here for everyone to make an educated decision on what to use. I was surprised to not see perlite included in this article. 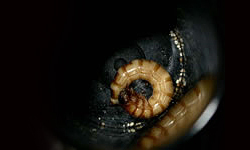 It’s been a long time staple of herp breeders, it’s cheap, easy to find, and easy to use. As for vermiculite, I’ve personally never had any problems using it or getting proper ratios. I haven’t tried hatchrite, but I’m leery of any product that takes the control out of my hands. I’m very hands on and like to determine for myself what affects my animals and offspring. SuperHatch is by far my favorite. I have not had any problems associated with it, when in comparison to vermiculite and perlite in regards to molding or drying out. SuperHatch is reusable and overall, in my opinion, the best. It’s not that hard to get the water ratio right; all you have to do is pour water in the cup with the SuperHatch so that the rocks are all wet. Hatchrite, dries out, which is why it’s not on my favorite list. When it dries out, it’s just like perlite. Good article. I too was surprised to find perlite not mentioned. This is one of the top 2 or 3 hatching materials in the hobby. On the comment about Hatch Rite, I’ve also had less than acceptable results with this medium when compared to other material. For me- hatch rate –> 2. Finally, on Super Hatch (or Supreme Hatch Material), the comment “however if the product is over- or under- moist” can be resolved simply by pouring the water in, go off and collect the eggs (about 2-3 minutes), and pour ALL the water off. It couldn’t be any easier. 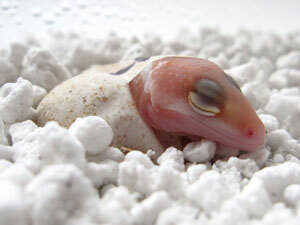 I use vermiculite for ages as a hatching material for corn snakes and Leopard geckos with excellent results. Wow. After this I will use hatch rite, thanks very good article. I use nothing at all. I place the eggs in a plain shoe box with a perforated lid to allow moister in. I then place this shoe box in a sweater box that has one inch of water in it and put the lid on the sweater box. Heating is done the same way you heat snakes with a heat tape underneath and thermostat.